Board-certified ophthalmologist Anand K. Shah M.D. and our staff look forward to welcoming you to our private practice. We are conveniently located near North Point Mall in Alpharetta, GA (between exits 9 & 10 on GA-400). We accept most major insurances and plans. In between plans or prefer to self-pay? We offer a flat rate and affordable options. Welcome to Eye Associates of North Atlanta, LLC Board-certified ophthalmologist Anand K. Shah M.D. and our staff look forward to welcoming you to our private practice. We offer comprehensive medical and surgical eye care for adults. Focused on You: Quality Care and Service At Eye Associates of North Atlanta, LLC, your eye care needs are our top priority. Dr. Shah, who has over a decade of medical experience, will complete a comprehensive eye exam and explain the results, ensuring all of your questions are answered. Our mission is to treat every patient as though they are a family member. Convenient Location and Online Appointment Requests We are conveniently located near North Point Mall in Alpharetta, GA (between exits 9 & 10 on GA-400). Our office hours are Monday through Friday 9am to 5pm. Additional evening and weekend hours based on availability. Click here to request an online appointment today. Most Major Medical Insurances Accepted We accept most major insurances and plans. In between plans or prefer to self-pay? We offer a flat rate and affordable options for self-pay patients. "If anyone needs eye surgery, especially cataract removal, I highly recommend Dr Shah." "Dr. Shah was very thorough with my exam. Great chairside manner." "If you are having a problem with your eyes, Dr. Shah is one to go to for help." "Excellent care and overall experience. I would highly recommend Dr. Shah." "Exceptional care, customer service, and a wonderful environment - very welcoming." "Dr. Shah was great! Very attentive to his patients and also very thorough." Hello and welcome! My name is Dr. Anand K. Shah, M.D. In 2016 I opened Eye Associates of North Atlanta, LLC in Alpharetta, Georgia to provide the highest quality eye care to patients throughout the area. Though I was born in Brooklyn, New York, I consider myself a local since I spent the majority of my childhood in Athens, Georgia. It was during my high school years there that I became interested in medicine and spent the next 14 years of my life training all over the country in amazing cities like Boston, Detroit, Denver, and Portland, Oregon. Despite my love of travel, I always knew I wanted to come back to the Southeast and so, in 2009, I came full circle and returned to Atlanta. Since returning, I have acquired valuable clinical and surgical experience with a highly regarded local group practice and most recently, a national healthcare organization. I am especially passionate about ophthalmology because it is a patient­-focused field where I can interact with teens and adults of all ages on a daily basis, and at the same time, apply my technical skills by performing microsurgery to improve vision. Nothing is more rewarding than restoring the sense of sight! 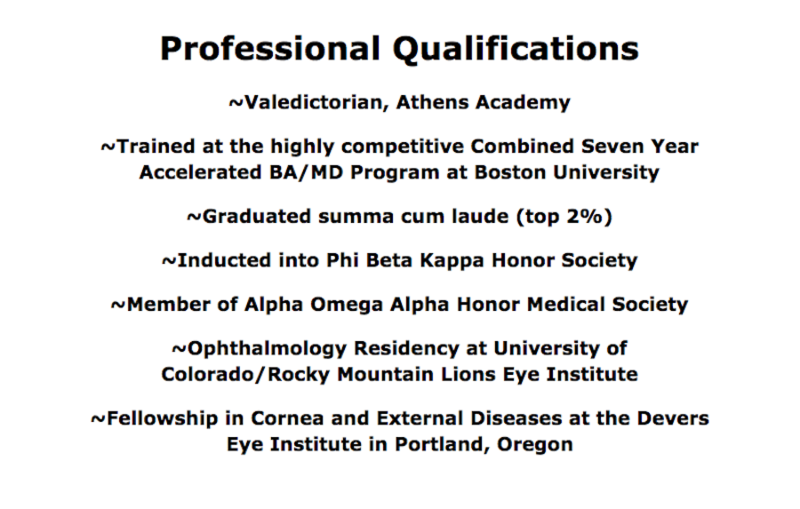 I also treat the full range of eye conditions and diseases and am very proficient in performing cataract surgery. Philosophically, I approach patient care from your perspective and will treat you the same way that I would want my family to be treated. In this way, I am committed to making sure that every aspect of your visit is pleasant and that all of your questions are answered by either myself or my staff. ​I strive to achieve a healthy work-life balance and encourage my patients to do the same. For me, it is through daily walks with my wife after work, running through the park, or just relaxing at home with my two small children. My family and I also enjoy traveling, skiing and hiking. We love to explore the great outdoors which is especially easy in Atlanta where the weather is warm nearly year round! I find that by cultivating my interests outside of work, I am constantly rejuvenated and refreshed. I look forward to welcoming you to our practice and the opportunity to care for you. Welcome to Eye Associates of North Atlanta, LLC! At Eye Associates of North Atlanta, LLC, we accept most major medical insurance plans. Here is a list of some of the plans we accept. Please contact our office if you do not see your insurance provider listed. "Dr. Shah was awesome! Anything with my eyes makes me really nervous, but both the office and the doctor were calm and comforting." "Dr. Shah took so much time with me and was very thorough and made sure I understood everything. Very knowledgeable. I would recommend." "Very good experience. Dr Shah took great care in explaining the issues and top of the line equipment and office!" "One of the best doctors that I have seen in a long time. He sincerely cares about his patients." "Dr. Shah is the best. He is thorough in his evaluation, diagnosis, course of treatment, surgery, and follow up."